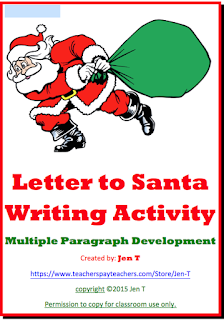 Every November or early December, I integrate my friendly letter writing lesson with holiday activities. The children enjoy shopping in catalogs and fliers for things they want and I have incorporated that into my activity as part of their pre-write. As I looped to higher elementary grades with my special education students, I decided to extend the activity to multiple paragraphs and incorporate positive behavior reflection and intentions. Many of my students have language and writing disabilities, so they need the format, paragraph frames, and sentence starters. In this activity, I have included a frame with and without verbal cues, depending on the needs of your students. There is also a tree map for the pre-write and a stocking craft as a fun follow up. I hope this becomes a fun tradition in your classroom too. Enjoy!